So many of you have reached out to tell me about your meal planning strategies and needs (thank you! I love hearing from you!) and though I think we’re getting dinner under control, and lunch usually comes easily – three cheers for leftovers! – breakfasts can be tricky. So far, the best solution I’ve found is to dole out a few mornings worth of yogurt (I love low fat Greek, but use whatever floats your boat, dairy or non-dairy) into individual containers and, in the morning I can grab one, pour some grain-free granola on top and be good to go. 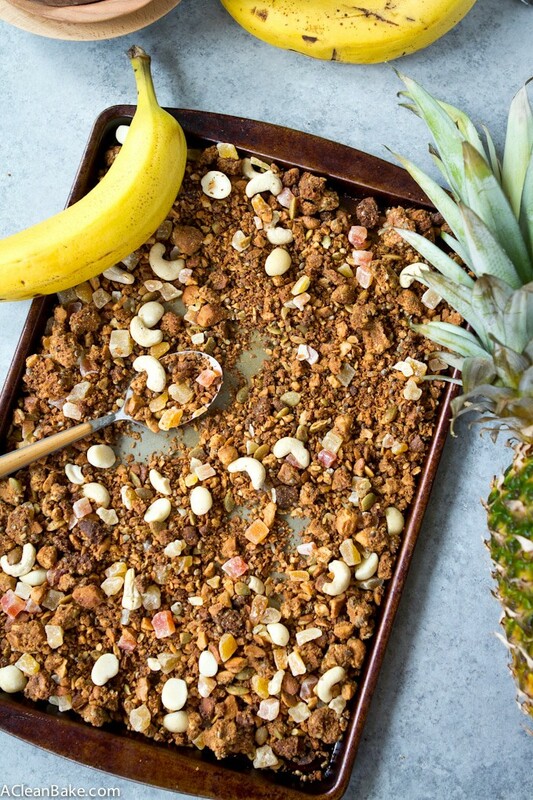 Although my original grain free and paleo granola (one reader named it Paleola, which I love) is always satisfying, I thought I’d mix it up a little for summer (that me: always living on the edge) with tropical ingredients and flavors. Since I can’t go on a Caribbean babymoon (*shakes fist at zika mosquitos) (why does breakfast talk inspire so many parenthetical digressions? ), this is the closest I am going to get to palm trees and virgin pina colatas on the beach. And so, it seems fitting that this is the recipe I made to celebrate my friend Leah’s impending bundle of joy. 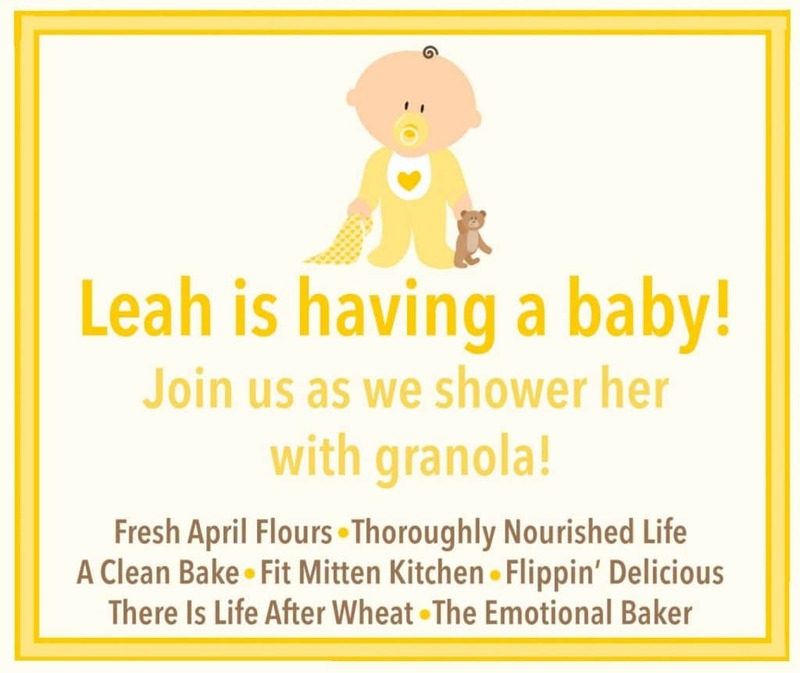 If you’re not familiar with Leah‘s work, she runs Grain Changer and is a card carrying member of the Granola Lover’s Fan Club, a thing I just made up but which we should probably officially start for Leah. Oh, and she’s expecting her first baby, a little boy, in a couple of weeks! able to be made in extra large clumps so you can eat it with one hand if/when necessary. Other people who have more experience with new-mom-ing than I (currently) have: does that cover everything? Oh, one more thing: aside from the convenience factor, the most important thing, to me anyway, would be (will be) the quality of the food I put in my body. Right after birth, Leah will be running on little sleep, healing physically, and maybe nourishing a whole other tiny-but-hungry body on top of it. I imagine it’s important to give yourself the most high quality, nutrient dense foods when your body is fielding that many demands, and this recipe does not disappoint. In fact, this grain free granola contains so many nutrient dense ingredients like macadamia nuts, cashews, pumpkin seeds, coconut oil and hemp seeds, that Leah might have some to spare! 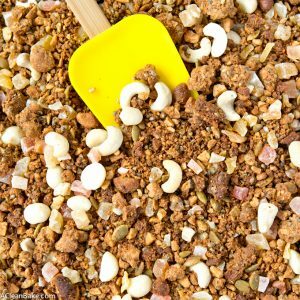 And since I used Now Foods products for most of the ingredients, I know that the granola is the best quality it can be. Leah and her baby deserve the best breakfast (or snack, or whatever you call what you’re shoving at your mouth at 2am while soothing a fussy baby) – and so do you! 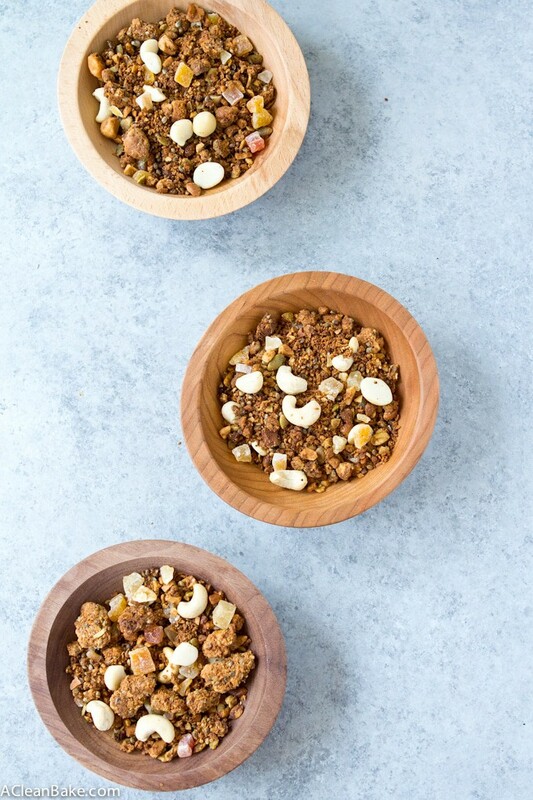 This paleo granola is not only full of texture and flavor, but also a healthier, grain free, gluten free and lower carb alternative to most sugary granolas! In the bowl of a food processor fitted with the "s" blade attachment, pulse 1 cup of the macadamia nuts, 1 cup of the cashews and pumpkin seeds 5-6 times until chopped. If you like larger chunks, you may need fewer pulses, and if you like a finer texture to your granola, add an additional 1-2 pulses. Transfer the chopped nuts to a large mixing bowl and toss with the hemp seeds and coconut to combine. Set aside. If your sunbutter is not thin enough to be stir-able, microwave it in a heatproof bowl for about 30 seconds until it is pliable enough to stir. Add the honey (or maple syrup), coconut oil and salt and stir well to combine. Pour the wet (sunbutter, etc) mixture into the dry (chopped nuts and coconut) mixture and stir until fully incorporated. It may seem, at first, as though there is not enough wet mixture to thoroughly coat and incorporate the dry, but keep stirring until it all comes together evenly. Turn the mixture out on to the prepared baking sheet and pat firmly into an even layer that covers the entire sheet. Bake for 25-35 minutes until the edges are golden. Remove from oven and cool completely on the pan. This gives the granola a chance to crisp up a bit. 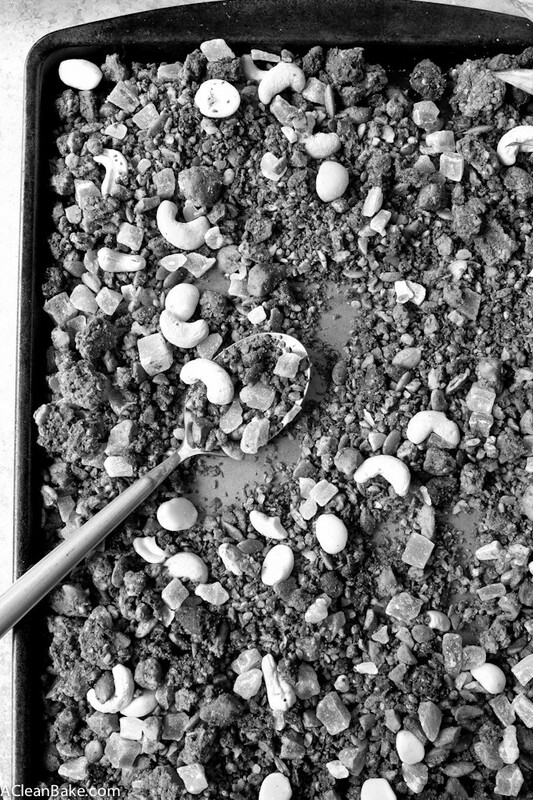 While the granola is cooling, roughly chop the remaining 1/2 cup (each) of macadamia nuts and cashews. 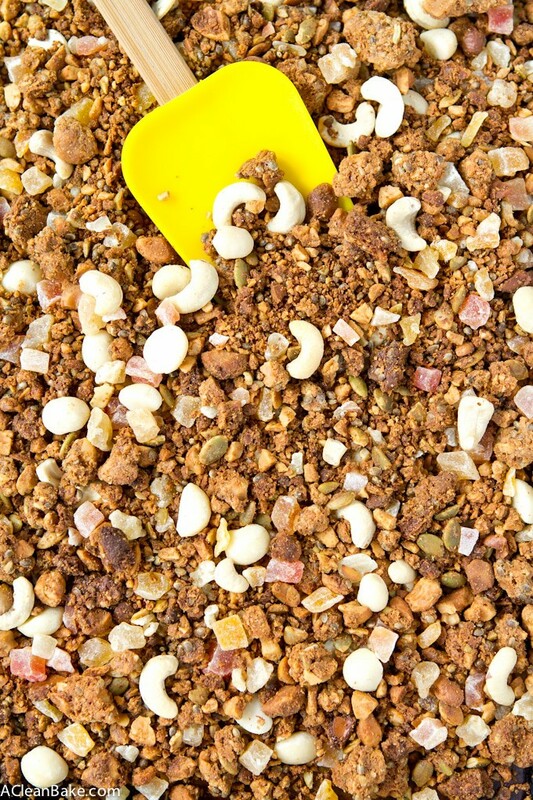 When the granola is cool, use your hands or a spatula to break it into large or small chunks (depending on your preference), then pour it all into a large (clean) mixing bowl. Add the dried fruit and the remaining nuts and toss to combine. Store leftovers in an airtight container at room temperature for up to 2 weeks, or in the freezer for up to 3 months. For the tropical fruit, I used Now Foods dried tropical fruit dices. If you can't find it and don't have time to order it, you can use a combination of dried bananas, dates and pineapple, all of which are available in the bulk bins of most Whole Foods or health food stores. Yield: It all depends on how fine or chunky you make yours, but this recipe will yield somewhere in the neighborhood of 4-5 cups. Dinners are SO hard! I feel your pain! Even when we do meal plan, it doesn’t always make it easier. Just last night I was way too tired to cook and my husband was coming home too late to cook so we threw in the towel and ordered in. The best laid plans, right? Thank goodness breakfast is easier! You’re so welcome! It was a pleasure to celebrate you and your family. I’m wishing you the fastest, least painful labor possible and the happiest, most baby-love-drunk first months as a mom. I can’t wait to see pictures of your little man! Congratulations!! Homemade granola is always so much fun to make, and I keep forgetting that. Great reminder and recipe! I’ll buy a membership to the granola lovers fan club for sure! I can’t wait to try out this delicious recipe! I love that is has so many great, nutrient dense ingredients, and a tropical twist. What a delicious way to shower Leah and Baby M. It was so much fun working with you ladies! It was great working with you too!! Ahhhh paleola, I love it! Give me all the tropical flavors (like dried pineapple + macadamias) so I can pretend its summer all year long! Heck yes! I’m totally with you! This. Is. So. Accurate. As I’m sitting here pumping, stuffing my face with a chocolate chip muffin which is already my 3rd meal of the day at 9am, easy-to-eat, accessible, and TASTY snacks are all the rage while breastfeeding/mom-ing. Granola is the perfect snack for times when you just need something quick and that can go with you somewhere easily. I love all the tropicalness you have going on in this granola, Nora! Huge fan! Ahh so good to know! I have to prep for (hopepfully) breast feeding in a few months, and I’ll have to make sure to stock my freezer in advance with plenty of snacks because it sounds like the hunger is NOT a joke! Thanks again for putting this little party together, Lynn! Oh absolutely! You have to have the umbrella!